George Street - Fluorescent Lights - Around 1958? The photo comes from the Edinburgh Street Lighting Collection of photos held at the Edinburgh City Archive. There is no photographer's name or other info on the photo, but I think it would probably have been taken soon after the fluorescent street lamps were installed in George Street in 1958. This view looks to the east from outside the offices of The Standard Life Assurance Company at 3 George Street. - The building with the pillars was Head Office of National Commercial Bank of Scotland, later taken over by Royal Bank of Scotland. This building has now become 'The Dome' Café. - The building with the dome roof and figure on top is the Royal Society of Edinburgh offices at the corner of George Street and Hanover Street. - The building with the dome at the extreme right of the photo is St George's Church on the far side of Charlotte Square, at the west end of George Street. 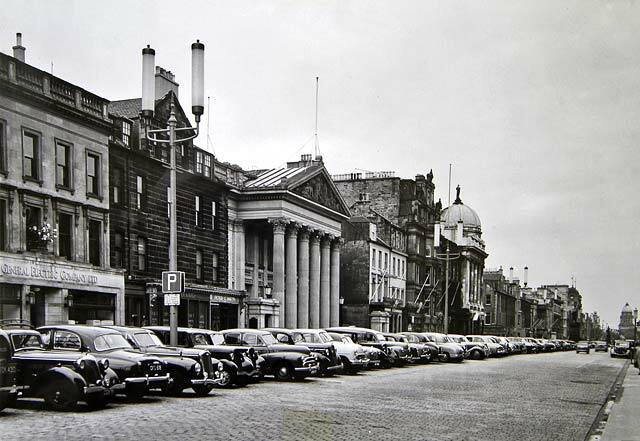 "I would date this photo to around 1958 as the fluorescent lanterns in George Street date from that time. Although I wasn't born then, I remember them very well as they were in-situ until 1983. These lanterns were mounted on post-top adaptors fitted to the top of the old traction poles in the centre of George Street. Extra concrete CU Highway X columns, fitted with sleeves, to accommodate the lanterns, were installed at the junctions. When lit, they (to me at least) resembled oversized ice-lollies." "All of the lanterns and columns in George Street were removed in 1983 Wall-mounted floodlights were installed and round-abouts were built around the bases of the statues at the Castle Street, Frederick Street and Hanover Street junctions." "What is the model of car with the unusual radiator in front of the Rover on the left-hand side of this photo?" "The car is a Triumph. Sorry, I don't know the model." Several people have now contacted me telling me that the car with the sloping radiator in this photo is a Triumph Dolomite.